It’s National Pollinator Awareness Week — a time to celebrate all of the bees, butterflies, beetles, bats, and bugs that contribute so much to our gardens and our tables. While the Monarchs may be stars of the show (along with their equally flashy companions, the Queens and the Viceroys) there are multitudes of other pollinators that deserve to be noticed. Some are beautiful; others are quite plain. Some we can’t help but notice; a few seem reluctant to be seen at all. Nevertheless, all have a role to play in our world, and all have something to teach us. Here are three delightful butterflies I recently found at the Brazoria Wildlife Refuge. They’re just a token of what’s waiting to be seen, if we take the time to look. Beautiful photos Linda! They are gorgeous. It’s easy to think that they, of all creatures, live in the closest thing to a fairytale world. I remember the days when a butterfly was “just” a butterfly. Some were more colorful than others, but I didn’t pay much attention to their variety — and I probably didn’t pay any attention at all to the less colorful ones. 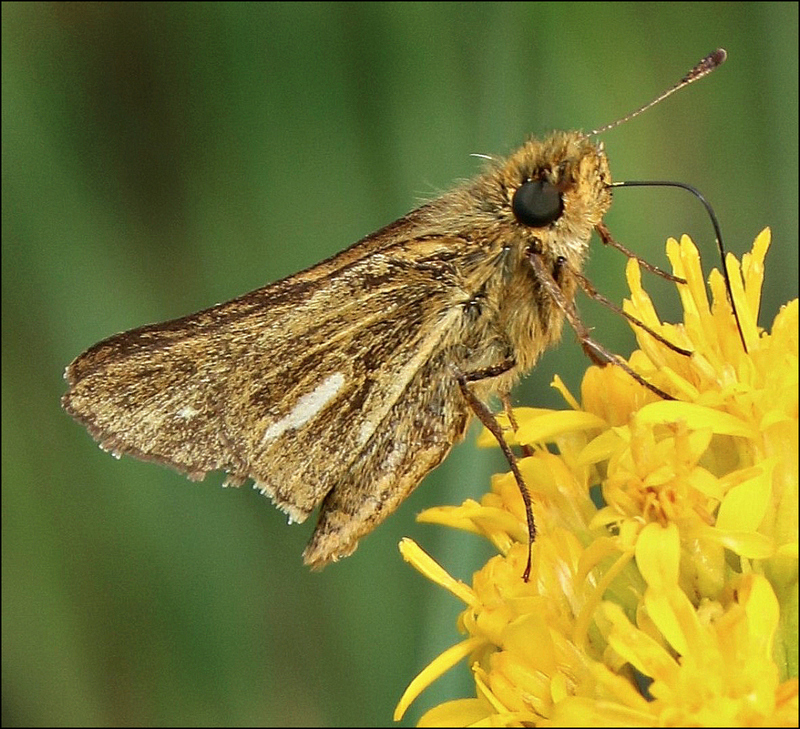 Now, when the guide book says, “The salt marsh skipper is distinguished by slight yellow lines and a white rectangular patch on its wings,” I can see it, and give that fluttering bit a name. Such fun! It’s easy to think that, and comforting, but what about all the predators ready to chomp these butterflies to pieces? They are, indeed. I presume you have your own fluttering bits in your garden enjoying those new white flowers, and that you’ll be able to enjoy them — once the heat breaks. Oh the butters. I adore the black swallowtail. I see them in my butterfly patch and then see the cats on fennel or rue This year none of the cats are surviving the birds or lizards.I’m thinking of buying some netting that is used in dresses. I want to cover the fennel when there are several cats on it. Maybe that way some will make it to chrysalis stage. The caterpillars of the black swallowtail are stunning. I have some photos on my blog, I think. But maybe not. I recently heard someone make reference to the number of caterpillars it takes to raise a baby bird through fledging. A nest of chickadees requires thousands of caterpillars; it’s another good reason to plant native. Native plants mean native caterpillars mean more food for native birds: and around and around we go. Of course, it’s good to have those caterpillars turn into butterflies, too, so they can make more caterpillars. Would it be possible to make an enclosure, and move some of the caterpillars into it, like they do at the nature centers? Of course, then you have to provide food, and so on, but the survival rate would surely go up. Next year I plan to put some fennel seeds in an old stock watering tank and then have some of the netting on hand that will keep birds out. I was going to do that that his year but just could not when I got sick with influenza A and then had 2 bad afib episodes that required one ambulance trip to the ER and the other one, my helper drove me to the ER. All that put me out of commission for about two months and I was barely crawling around due to the fatigue. But, hey I’m alive and grateful. I did manage to get cucumbers, tomatoes, peppers, and two kinds of squash planted with the help of my helper. It is a late garden but everything is doing pretty good. Wish you lived near by, I would keep you supplied with vegetables. I don’t use any kind of poisons in my yard or garden. Just good healthy compost and barn yard manure. I’m glad to hear your garden’s doing well, even if it is a bit late. I’m even happier to know that you’re doing well. You’ve had a hard winter and spring, so being able to do even a little bit probably feels pretty good. The watering tank idea seems like a good one. I’m really surprised that I haven’t found any caterpillars yet this year. Others seem to be finding them all the time, so I guess I haven’t learned how to look for them yet. I’ll be glad when the weather straightens out and gets into some kind of a pattern, so I can be more productive at work, and have a little extra time to go caterpillar-hunting! I’m not seeing very many butterflies. A few giant swallowtails, black swallowtails, queens and gulf fritillaries and that’s about it. I hope it’s just a cycle thing and not something due to climate change. etc. I was out at Brazoria today, and saw clouds of white butterflies, some fritillaries, and — a monarch! I got there early enough that it was still on the dewy grass. I suppose it was drying its wings. There was a tremendous amount of milkweed, too. There was plenty of seed flying around from the slim milkweed, but there still are new plants and plenty of unopened pods of the green. It was great to see. Very nice shots. The swallowtail is beautiful, but the skipper is very appealing, like a fuzzy pet. And “Salt Marsh Skipper” sounds like a fun spinoff of “Gilligan’s Island”. I have a hard enough time trying to properly identify flowers, which are considerate enough to stand still. Even getting a photo of a butterfly is an iffy proposition for me at this point, but if I do get a decent photo, identification still can be a challenge. 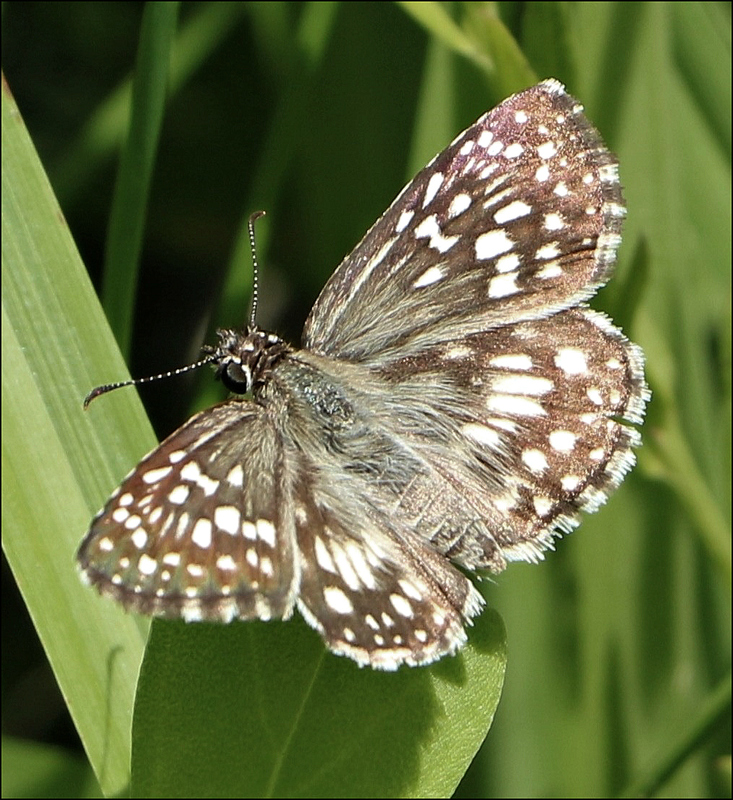 My Butterflies of Houston and Southeast Texas lists fifty-seven species of skippers. My favorite name? The “obscure skipper.” I’m going to try and find that one. They’re gaudy, gossamer creatures and I love them. Like you, I find them enchanting. Of course, gaudy attracts attention, and gossamer is fragile, so there’s that. As a woman tending monarchs down at Brazoria said, “Sometimes butterflies are just flitting about, but most of the time they’re either looking for their next meal or running for their lives.” There’s a metaphor in there, somewhere. I love butterflies. You would appreciate this — the last day I saw Diana, I was in St.Louis and she took me to the Butterfly Garden, a part of Missouri Botanical Gardens. To this day, when I see butterflies, I think of our friend. I use the Missouri Botanical Gardens website often, but I’d never made the connection with St. Louis — and, hence, Diana. What a perfect last day you had with her — she was such a fashionable, flitting bit of beauty herself. I hate that she’s gone, but I’m so happy that you had that time with her. In the last few days I’ve noticed that several native plants that traditionally start flowering in late summer or early fall are blooming already. Your twisted-leaf goldenrod is another one. The Wildflower Center page lists August as the first month in its bloom period. I checked the date on the photo and discovered this was an especially early bloomer: February 11. I remember my surprise at seeing goldenrod that day. In fact, I was so surprised I stopped to make sure that’s what it was, and that’s when I discovered the butterflies. Now I’m wondering if that patch of prairie was burned last fall. I’ll have to inquire. When I took the photo, I hadn’t yet learned about the effects of fire on subsequent bloom times. Given that the picture is from February 11, perhaps the goldenrod was a hold-over from the fall into the winter rather than the early-arriver it would more likely be in June. Good point, especially since it was a relatively mild winter. I rate the severity of winters by the number of times I have to drag plants into the house, and this year the number was zero. Love the swallowtail! These photos are simply gorgeous, Linda. So fascinating to see another part of this land. Thank you! I’ve seen at least two other kinds of swallowtail, but I couldn’t get photos of either of them. They wouldn’t land, and after chasing a yellow one for a while, it crossed my mind that it might not be the smartest thing to do. Since then, I’ve learned that some species will fly and rest at certain times of day. So, I’m going to try and learn butterfly schedules, and see if I can find a few at rest. There ought to be some hanging around your place! Sweet finds! 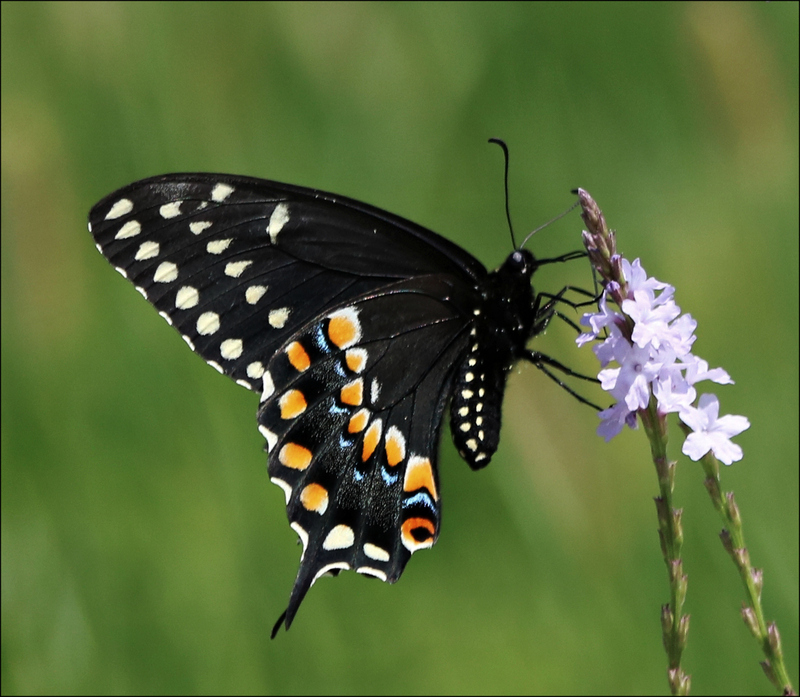 Oh that Swallowtail, how handsome – and on the little vervain. I used to find vervain (Verbena hastata) in fields outside of New York City – well, pretty far from Manhattan actually! Lately any new butterflies i see are hard to identify – they’re just not popping out at me in the book. Got to keep trying I guess. Here’s to ephemeral beauty! I don’t think I’ve seen your Verbena hastata, but it’s apparently native in Texas. The USDA maps are down, so I can’t see if it’s my part of the state, but I’ll know to watch for it now. It’s a beautiful plant, like all of the vervains. As for butterfly identification, it’s another whole new world. Thank goodness for the books, the websites, and the experts who can help us – and who enjoy doing so. That swallowtail is a thoroughbred! Gorgeous! Thanks for the Pollinators Awareness notice! The relationships between plants and pollinators is a fascinating one — and it’s certainly something I paid little attention to until I was well into adulthood. Once I learned about the special connection between monarchs and milkweeds, I began looking for other examples, and they’re everywhere. Speaking of hummingbirds, I thought I had seen one recently, but it turned out to be a hawk moth — I think a pink-spotted one. Now I have something else to watch for. Those hawk moths are spectacular and yes, they look like hummingbirds or like bats! Last night I was visiting with a friend and we were lookinig at the giant oversized painting of a colorful heliconia. the flower might be four feet tall/long, and I said, “I’m tempted to ‘design’ an endemic species that would be the pollinator of that flower… Tossing around ideas, we thought it would be fun to go to Playamart and find a piece of driftwood and then coax the bird from its form and then hang it from the ceiling! I think it’s a wonderful idea. Now that we have the cats and the plants named, we’ll have to work on the naming of your bird. You ought to give it four wings, and rotating tail feathers like a helicopter, since it will be hovering above the heliconia. I’ll be back on the coast in a few days, and for sure a trip to Playamart is way overdue… lots ‘incubating’ for some projects, and this will fit in well with the plans… thanks! These are wonderful, Linda :) The world so needs all its little pollinators or the world would no longer be as we know it. What a great analogy — one I’d never thought of, but it fits. It seems to be a great year for butterflies (and lizards, by the way). I’ve not seen so many love bugs in years, either — especially farther inland. Let’s just hope the chiggers and mosquitos aren’t as abundant. Getting used to the heat is an on-going project. I did pick up an interior job that will allow for a couple of hours in AC every afternoon. It’s the little things that count. The skippers have long had a special place in my regard. I believe that they are the fastest fliers among all the Lepidoptera, and it is really amazing how they can land so precisely on a flower after zooming in like jet fighters! I love pollinators! But normally I only think of the bees since they pollinate over 50% of our food. Every October, one of the universities in my area hosts an exhibit of what would be exotic butterflies, namely species you wouldn’t be likely to see in our backyards up north. I have gone a couple times, and really enjoyed what I saw. The one downfall is it’s incredibly hot inside the greenhouse for October! I never thought much beyond bees as pollinators myself, until after I got interested in our native plants. I always had assumed that the little flies were just hanging around, and the butterflies were only after their own nourishment. As it turns out, they all have a job to do — it really is fascinating. There are a couple of wonderful butterfly gardens in our area: one in Houston, and one in Galveston. But even more fun is butterfly chasing in the open. I’ve read that there are a hundred or so butterfly species in the Houston area. I’ve found about a dozen — I’d better get busy! Thanks, Dina. I was most surprised by the fuzziness on the two skippers. Somehow I’d come to imagine butterflies as sleek little creatures, but not all of them are. I’m glad these pleased you. I was pleased to read that others also appreciate cats in addition to the butterfly. Well done in the identification of them as well as the lovely photographs. When I first began paying attention to these wonderful creatures, I was more than a little confused by references to “cats.” For me, caterpillars always had been caterpillars and cats had been cats. I didn’t realize that people abbreviate “caterpillars” in that way, and couldn’t figure out why they’d want cats around their butterflies. Silly me. One thing that’s surprised me about the butterflies is how tiny some of them are. I found a beautiful yellow and red one that couldn’t have been more than a half-inch long. I’m still trying to identify it, while lurking around the area where I found it to try and get a better photo. As I recently stated, monarchs are my lepidopteran holy grail but because of scarcity rather than some level of impressiveness. I’d be happy to have these nice shots as my own and am always thrilled to capture an image of any butterfly or moth…or countless other insects. Very nice images indeed. I’m still at the stage where getting a decent photo of anything delights me no end, and if I can identify it, too? Well, there’s nothing better than that. And of course I’m discovering what you certainly know: there’s never any predicting what the next discovery will be. That’s a good bit of the fun, whether it’s a butterfly or a sunrise or an unexpected flower. If what we hope for doesn’t show up, something will. Early on, one of the best bits of advice I got was to not go out with any goals or preconceived notion and just respond to whatever presents itself. I do leave the house with some idea of what I’d like to do…otherwise I am sure I’d miss the majority of sunrise and full moon shots I capture…but for all other purposes it is good to have an open mind. Much presents itself when we practice simple observation. Keep that delight happening, Linda. That is what’s most important. Of course, simple observation isn’t necessarily simple. Learning how to see is part of the equation — so much so that the phrase “learning to see” is a title still lingering in my draft files.